St Francis was born into a prosperous silk merchant family of seven children at Assisi, Italy. His first name was Giovanni but his father nicknamed him Francesco – the Frenchman. He enjoyed the good-life trappings of wealth, despite having been held captive for a year following a military expedition. 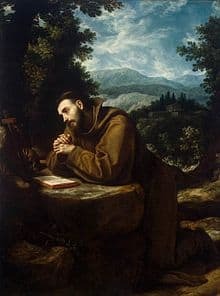 There are many inspirational stories which led to St Francis’ realisation that his short mortal life had a greater purpose than pleasurable short-term gain. One well-documented account is when a beggar approached him while he was working on his father’s market clothing stall. St Francis refused him “spare coins”, but on reflection, he closed the stall and went searching for the beggar. When he found him, he gave him all the money he had. Those who saw mocked his actions and his father was bereft at his behaviour. However, this was only mildly reflective of the man that St Francis wished to be. Interestingly, St Francis was never ordained a Priest, choosing instead to live a very simple life of prayer, preaching and poverty. He set up multiple Orders for men and women, generally referred to as the Franciscans, and the Poor Clares. Their simple rule was, “To follow the teachings of our Lord Jesus Christ and to walk in his footsteps”. St Francis’ Feast Day is the 4th October. He is the Patron Saint of animals and, with St Catherine of Siena, Patron Saint of Italy.